AB 962, a new law restricting ammo sales, was passed by the California Legislature last Friday and sent to Governor Schwarzenegger’s desk. If not vetoed by the Governor, this bill could have a major negative effect on the shooting sports in the Golden State. AB 962, authored by Assemblyman De León (Dem. Los Angeles) was narrowly passed on a strict party line vote, on the last day of the Legislative session. 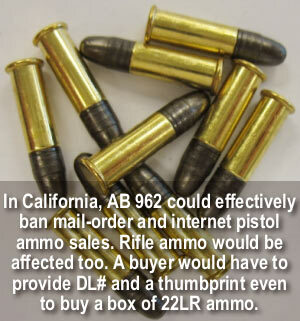 AB 962 will restrict the sales of pistol ammunition. Unfortunately, the restriction will include common rifle ammo such as .22LR, .22 Magnum, and .223 Rem, because these cartridges are also used in pistols. If codified into law, commencing February 1, 2011, AB 962 would require handgun ammunition vendors to obtain a complete profile on ammo-purchasers including: residential address, phone number, Driver’s License number, birth date, and signature. In addition, ammo buyers must provide a thumbprint when purchasing pistol ammunition. A violation of these provisions would be a misdemeanor. The good news is that AB 962 was amended to eliminate the provision that would criminalize the “sale or transfer” or more than 50 rounds of pistol ammunition per month. Had that clause survived, it would have a chilling effect on all youth training programs because rangemasters, scout leaders, or shooting coaches could be jailed for handing out more than one box of rimfire ammo. The California Rifle and Pistol Assn. (CRPA) is asking ALL California gun owners to contact Gov. Schwarzenegger immediately and urge him to VETO AB 962. You can send an email via the Governor’s home page at www.gov.ca.gov/interact. (Type your name and email address, select Gun Control under the “Choose Your Subject” menu, hit “Submit” — then write your message.) You can also call or send a fax to the Governor’s office (Phone (916) 445-2841; Fax (916) 558-3160). Gov. Schwarzenegger has until October 11, 2009 to sign, approve without signing, or veto bills passed by the Legislature. Share the post "California Legislature Approves Restriction on Ammo Sales — Bill Goes to Governor"
For the shooting sports to grow, it is vital to bring in new participants, particularly juniors and women. The National Shooting Sports Foundation’s First Shots program has been very successful in introducing new shooters to the sport. Nearly half of the First Shots program’s participants have been female. A new NSSF Report shows that a high percentage of women who get started with the First Shots program go on to acquire firearms and become active shooters. 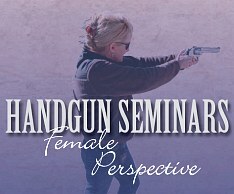 For example, after attending a First Shots seminar at their local range, 47 percent of women participants have met their local requirements to purchase a handgun, 26 percent said they have already purchased a handgun, and 58 percent said they are planning to purchase a handgun in the future. When asked what their primary reason for purchasing a handgun would be, 86 percent said personal protection. In related news, Champion action shooters Sharyn Cohen, Julie Golob and Kippi Leatham have launched the new Women of USPSA website, an online resource for women in practical shooting. WomenofUSPSA.com will help encourage women to participate in the shooting sports by profiling the women who compete in United States Practical Shooting Association (USPSA) events. 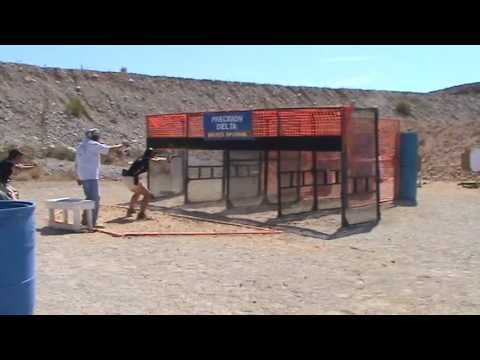 Shown below is Jessie Abbate at the USPSA Nationals, this week, as posted on the Women of USPSA website Blog. This report courtesy NSSF. Images copyright NSSF, all rights reserved. 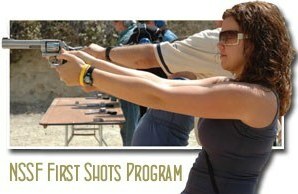 Share the post "First Shots Program Succeeds with Lady Shooters"
The 24th annual Gun Rights Policy Conference (GRPC) will be held Sept. 25-27 in St. Louis, Missouri. More than 50 speakers, including such notables as Rep. Ron Paul, John Lott, Wayne LaPierre, Alan Gura, and Michael Reagan, will address those in attendance. Hot topics this year will include: city gun bans, youth violence, “smart” guns, concealed carry, federal legislation, legal actions, gun show regulation, state and local activity. Conference organizers will also preview important upcoming court cases and revisit the landmark U.S. Supreme Court decision in DC v. Heller. To learn more about the event or to register online, CLICK THIS LINK and scroll down to mid-page. You can also return a registration form by mail (form below). CLICK HERE for 2009 GRPC Conference Flyer and Registration Form (.pdf file). 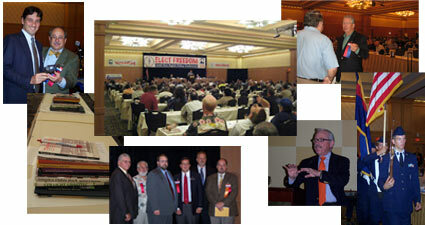 Share the post "Gun Rights Policy Conference Next Week"